President Donald Trump claimed a pipeline project has made Germany “totally controlled” by and “captive to Russia” during a combative breakfast Wednesday that kicked off what was already expected to be a fraught NATO summit in Brussels. US President Donald Trump takes his seat as he attends the multilateral meeting of the North Atlantic Council on Wednesday. 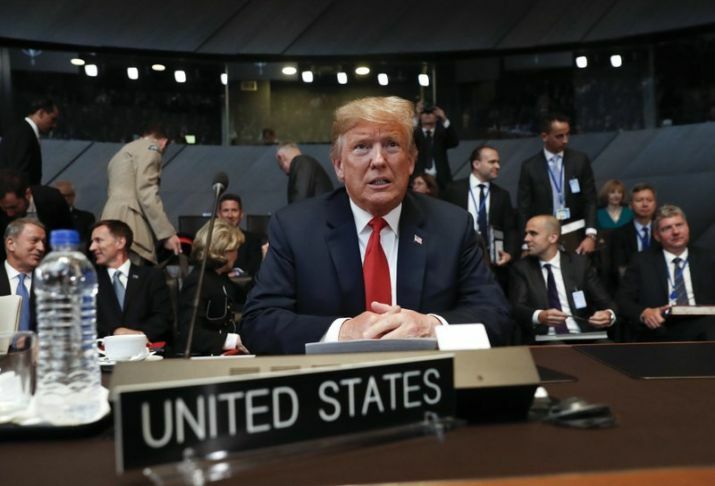 Brussels: US President Donald Trump tore into this week’s NATO summit questioning the value of a military alliance that has defined decades of American foreign policy, torching an ally and proposing a massive increase in European defense spending. Under fire for his warm embrace of Russia’s Vladimir Putin, Trump on Wednesday turned a harsh spotlight on Germany’s own ties to Russia, declaring that a natural gas pipeline venture with Moscow has left Angela Merkel’s government “totally controlled” and “captive” to Russia. He demanded via tweet that members “Must pay 2% of GDP IMMEDIATELY, not by 2025” and then rattled them further by privately suggesting member nations should spend 4 percent of their gross domestic product on defense — a bigger share than even the United States currently pays, according to NATO statistics. It was the most recent in a series of demands and insults that critics fear will undermine a decades-old alliance launched to counterbalance Soviet aggressions. And it comes just days before Trump sits down with Putin in Finland at the conclusion of his closely watched European trip. Trump has spent weeks berating members of the alliance for failing to spend enough of their money on defense, accusing Europe of freeloading off the U.S. and raising doubts about whether he would come to members’ defense if they were ever attacked. From Brussels, Trump heads to England, where May’s government is in turmoil over her plans for exiting the European Union. Although administration officials point to the long-standing alliance between the United States and the United Kingdom, Trump’s itinerary will largely keep him out of central London, where significant protests are expected. Instead, a series of events — a black-tie dinner with business leaders, a meeting with May and an audience with Queen Elizabeth II — will happen outside the bustling city, where Mayor Sadiq Khan has been in a verbal battle with Trump.